The Pedigree Adoption Drive in New Zealand offers support to thousands of abandoned dogs across the country. 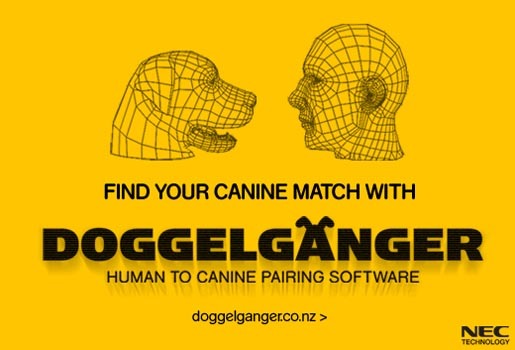 The latest campaign, launched in April 2011, increased awareness of the plight of homeless dogs by inviting New Zealanders to log in to the Doggelganger site, doggelganger.co.nz, where they could find a match with a homeless dog through an analysis of their own facial features. Doggelgänger human to canine pairing software was designed to connect homeless dogs to their human doubles. The site analyses your features, and compares them with a nationwide database of real dogs looking for adoption. People were alerted to the website through an electronic direct marketing campaign sent to the mailing list of affiliated animal justice partners. 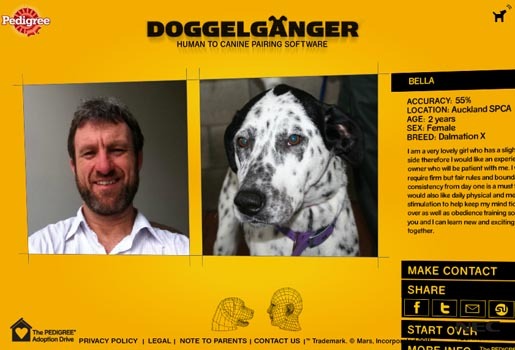 The Doggelganger campaign was developed at Colenso BBDO, Auckland, by executive creative director Nick Worthington, creative director/copywriter Levi Slavin, creative director/digital designer/digital creative director Aaron Turk, art director/digital art director Jae Morrison, digital developers Paul Headington and Colin Williams, account director Karla Fisher, senior account manager Dave Munn, agency producer Haydn Thomsen. Sound was designed at Franklin Road. Post production was done at Kaleidoscope.